My Birth Story | Then there were three.. If you don't follow me on social media, then you may not know that we welcomed our second daughter into the world on the 18th of August; hence the lack of blogging! My first daughter arrived two days early and naively I thought that this one would also make her way into the world earlier than planned. However, little Ffion had other plans and kept us waiting so that I was two days overdue; certainly not the worst situation but it felt like an eternity. 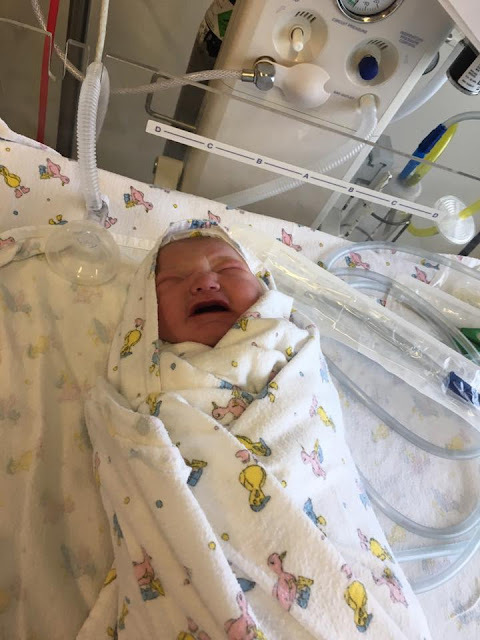 I don't think that I have ever gone into Aoife's labour on my blog before; a short summary is that I was already 8cm dilated by the time I got to the hospital and the birth resulted in a large PPH and a third degree tear. It took a two night hospital stay along with a three unit blood transfusion before I was discharged and could go home. 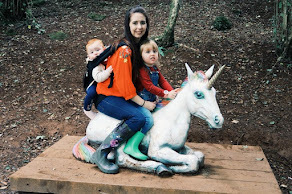 This time around I was desperate for a home birth - I am not a fan of hospitals and knew that I would be more relaxed at home. Also, I do feel that one of the reasons for my third degree tear was being made to push when my body wasn't ready; I was keen for as little intervention/checks as possible this time round. 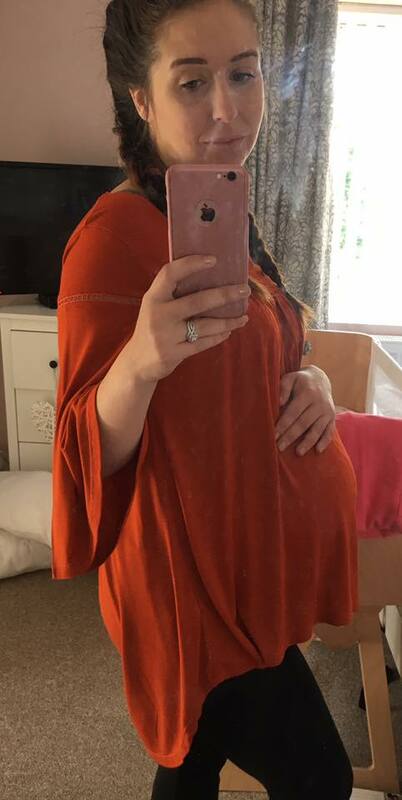 Unfortunately, when I was 38 weeks pregnant I was advised that, due to the complications with my first labour, a home birth would not be the safest option for myself or my baby. I was however, granted the use of the Midwife Led Unit at the hospital, provided that I was fully aware of the risks and agreed to be transferred to the labour ward if needed. As mentioned, with Aoife arriving early I was adamant that this little bundle would too. My due date arrived and for a while, everything was normal and uneventful. In the afternoon I started feeling the tell tale back aches and also, slightly TMI, but a small show too. I decided to ring the hospital who advised to keep an eye on things and once the pains became more regular, to call them back. However, this must have jinxed things as everything died down overnight and the next day it was as though nothing had ever happened. I was now officially overdue so I decided to try and tempt fate by heading out to a local retail park with a friend. Despite my hopes and best efforts, this made no difference and that night I went to bed, still pregnant and feeling deflated. The next morning I had a consultant appointment to book my induction date. Whilst there, the consultant advised me that he wasn't happy for me to use the MLU and wanted me on the labour ward for the full duration. After a lot of persuasion and him having to speak to his senior, I was again granted the use of the MLU. He also enquired as to if I had a cervical sweep booked in with the midwife, which I did have for a week later. At this point I mentioned the back pains and small show of which I had had a couple of days earlier and enquired if I could receive a sweep that day as well; luckily he agreed to do this and went to find a midwife to supervise him. Now, I have never been in the position to have a sweep before but had heard that they weren't the most pleasant of things. Whoever told me they were "uncomfortable" was certainly downplaying it! When the midwife arrived, I made myself comfortable on the bed and she asked me if I wanted to hold her hand. My response was "no I'll be fine. It can't be any worse than labour can it?" ... her response was "I think you should hold my hand". At this point I genuinely wondered what on earth I had let myself in for. Without beating around the bush, I would happily take labour again over that sweep. Now, I kind of knew what a sweep entailed before having one done; the midwife pops a finger in to reach the cervix and makes a sweeping motion to attempt to separate the sac surrounding the baby from the cervix. What I didn't expect was, apologies in advance for being crude, for it to feel as though a whole arm was being shoved up there and pushing my cervix out of my mouth. My language isn't very ladylike at the best of times, so you can only imagine the profanities coming out of my mouth during the process. The consultant advised that he could stop if I had wanted, but I was already committed to getting this baby out by that point and would have done anything, so I allowed for him to continue. After what felt like an hour, but in reality couldn't have been more than a minute, he was done and I was rather shell shocked as to how brutal it had been. Whilst getting dressed I mentioned to the midwife that if that didn't get the baby moving then I don't know what would! Once dressed I was sat back down with the consultant, trying to act as though the last few minutes had never happened and the language that had escaped my mouth had never been said. At this point his words to me were; "from what I can feel, you won't be making your induction date; your baby will be here within a week". This obviously made me feel a little better, but as everyone knows, babies have a mind of their own about when they will grace us with their presence, so I didn't get my hopes set on it. I was then sent to have my blood taken in a different section of the hospital to check that my low iron had resolved itself ready for giving birth in the MLU. I finally got home about 2 hours after my initial appointment with the consultant and promptly started getting period type pains; this I figured was normal after a sweep, especially after the brutal one that I had endured. Along with the pains, I started to have more of a show, which again I figured was pretty normal. However, I didn't fancy taking any risks and made my father accompany me to drop Aoife off to nursery that lunch time. On the way home from dropping Aoife off, the pains started to get stronger and weren't constant, they were more on and off; more like contractions. I still didn't think too much of it as I didn't want to get my hopes up into thinking this was it. At around 2pm I had a phone call of my husband to tell me that he had a five hour gap between his jobs and could I collect him; luckily he was only parked up a five minute drive down the road. By this point, the pains had intensified but weren't in a regular pattern, so I decided to chance it and make the short drive to collect him. When we arrived home, I decided to have a bath to check if the pains would die down or not. If anything, the bath intensified the pains which resulted in me being on all fours in the bath, screaming like a banshee. I still however managed to somehow wash my hair - priorities and all that! 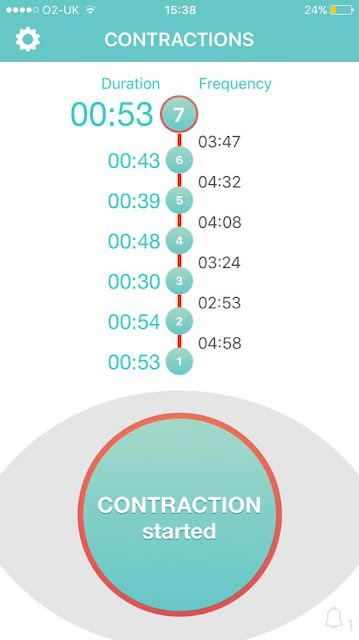 my contractions, so off I went to download a contraction app. After the first four timed contractions, a message flashed up on the app to tell me to go straight to hospital. Now, me being me, I didn't want to tempt fate by calling the hospital for everything to die down, so I left it for half an hour. By this point I had managed to get dressed and had made it downstairs; to this day I still do not know how I managed this as my contractions were every four minutes. With Aoife's labour, at this point I was 8cm dilated when my contractions were this frequent. 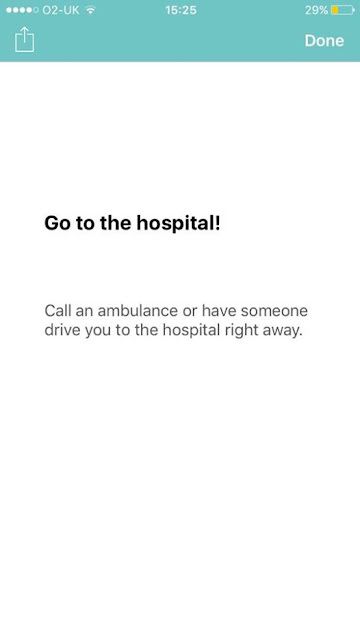 In the end, my friends convinced me to call the hospital. After getting through to them I was halfway through speaking to a midwife when I could feel another contraction brewing. I threw the phone to my husband and was back on all fours which was the only position of which was helping. When I eventually spoke to the midwife again, she advised that it definitely sounded like something was happening and to make my way to the hospital as soon as possible. However, my husband had other ideas and we had to wait for my father to arrive so that he could drop my husband's work keys to one of his colleagues for him - this took up around twenty minutes but it genuinely felt like an eternity. The hospital was about a thirty five minute drive, without any traffic. We left the house at 16:10 on a Friday afternoon and the route requires motorway driving - as you can imagine, the roads were packed! My husband ended up driving 100mph with his hazard lights flashing, beeping people and flashing them out of the way. At the time of leaving the house, my contractions were approximately two minutes apart and I was panicking, but trying to just focus on not giving birth in the car. When we were about fifteen minutes from the hospital I felt the tell tale pressure in my bum and the urge to push. Still to this day I honestly do not know how I managed to stop myself from pushing! We arrived in the hospital car park at 16:45 and my husband ran to get a wheelchair for me; he came back with a strange man who, I assume, had just finished his shift at the hospital and both of them helped me into the wheelchair and got me to the Antenatal Ward for the pre assessment before I could be transferred to the MLU. As soon as we arrived, I was whisked into an assessment room and practically thrown onto a bed where my leggings were ripped off. Then I heard the midwife shout "I can see the head, someone get me a delivery pack" - this resulted in midwives frantically running around getting everything ready. As I had come in so quickly, they didn't have time to put me on a trace, so the midwife had to resort to handheld doppler. As they were using the doppler I noticed that they couldn't find the babies heartbeat; usually her heartbeat was easy to find and I even I had never had any troubles finding it using my own doppler. To see the experienced midwife having trouble locating it panicked me; eventually I heard a heartbeat but instantly knew that it wasn't good. My husband later informed me that, at this point, the two midwives looked at each other before one proceeded to advise us that our daughter was in distress and they had to get me to the Labour Ward quickly incase they needed to intervene. At this point I begged for gas and air, to be told there was no time - one of the midwives ended up removing the mouth piece off of the canister and I was advised to "bite it". One of the other midwives ran to open the elevator and I was promptly and quickly whisked upstairs and into a room to deliver my daughter. My poor husband was pushed to one side as machines were pulled into the room and I had to resort to holding onto the mattress rather than his hands for the main event. Somehow, and I still don't know how, I managed to deliver my little girl with three pushes and no pain relief; just a lot of screaming from me! The moment that every parent hopes for when their baby is born is to hear their first cries; the sign that their little one has arrived and is well. We didn't hear this and my heart sank - I remember saying "she's not crying, is she okay? ", despite me being able to see her, I couldn't help but think the worst. Luckily, our little girl was completely fine and was born at 16:56, less than fifteen minutes after arriving at the hospital and only seven minutes after the first initial examination - she certainly didn't fancy waiting around at the end of it! Of course, after the PPH and tear I experienced with Aoife I was concerned that history would repeat itself, but luckily it didn't. The end result was a normal blood loss and a small graze, which I was so thankful for. 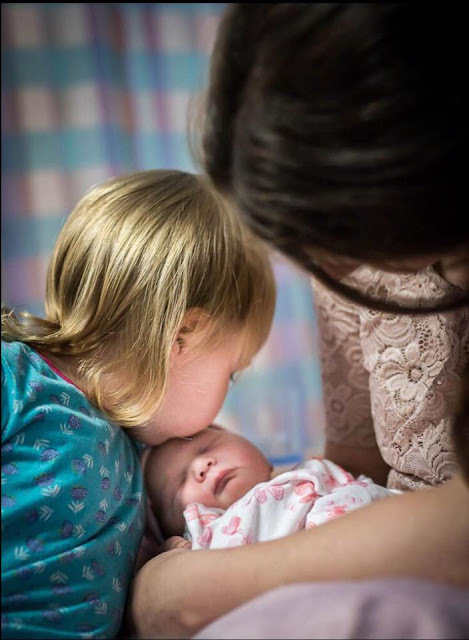 However, due to her speediness, the birth photographer, Sarah Debnam, that we had lined up missed the main event; but being the most amazing woman that she is, she continued her journey to take photos of Aoife meeting her baby sister for the first time of which I will cherish forever. More on our photographer will follow in a separate post. Another issue, which not many people knew of, was that the BBC were meant to film the birth for an upcoming documentary. Of course, they missed it too, but they became little Ffion's first visitors when they came to film a couple of days later. Again, more will be revealed at a later date! I can finally say that my family is finally complete; no doubt in a few years I will become broody again, especially after my upcoming surrogacy journey, but hopefully I can last a few more years before I think of adding another one to my clan!